Hospital workers in Wigan will strike for another seven days in two weeks time, as their dispute over being outsourced to a private company wholly owned by their NHS trust continues. Formal notice of the strike, which will start at 6am on 17 July, was sent to the Wrightington, Wigan and Leigh NHS Trust after their latest five-day action ended yesterday. This will be the fourth period of industrial action taken by UNISON members who work in roles including portering, cleaning and catering. 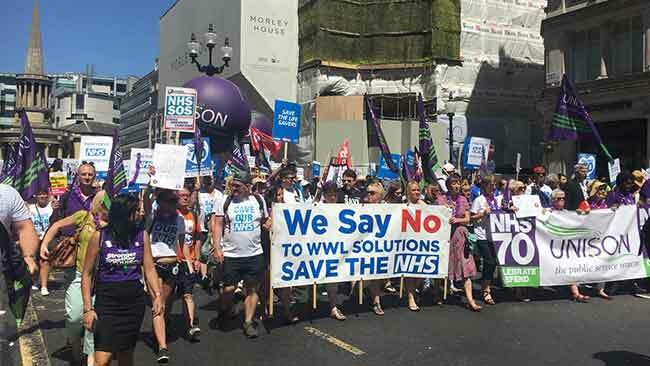 The trust’s plan to outsource nearly 900 staff to a private limited company, WWL Solutions Ltd, has already seen strikes on 23-24 May and 8-10 June, plus a five-day strike from 28 June to 3 July. Staff are striking to protect their terms and conditions and the living standards of future generations of hospital staff, and to keep the NHS team together. The campaign has received backing from the public and from senior national and local politicians including Labour leader Jeremy Corbyn, and local MPs Lisa Nandy, Jo Platt, and Yvonne Fovargue. 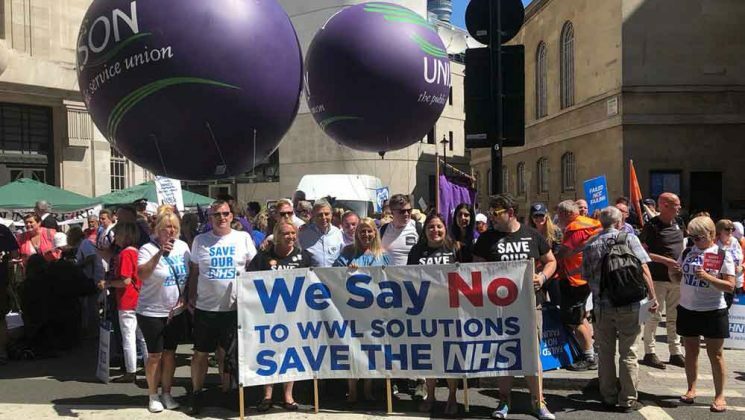 More than 50 striking workers from the trust took part in the national demonstration for the NHS on Saturday 30 June, and were impressed by the support they received from UNISON general secretary Dave Prentis, TUC general secretary Frances O’Grady and shadow health secretary Jon Ashworth. She added: “We are Wiganers loud and proud and we made our presence known on the march. “We have a real sense of strength. We want to work for the NHS, not for WWL Solutions. Dave Prentis has written to all UNISON branches and activists stressing the importance of the workers’ fight and urging them to donate to a hardship fund. He said the move by NHS trusts to set up subsidiary companies for support staff are “a threat to jobs and terms and conditions. They’re a slippery slope towards backdoor privatisation. “That’s why this strike action – which has so much support amongst staff and the local community – is so important to our union. Speaking after the end of the last five-day strike, UNISON north-west regional organiser Lizanne Devonport said that “staff are resolute in their determination to keep the NHS together. “The last few days have seen very strong strike action across the trust’s hospital sites. Staff are receiving tremendous support locally and from people who care about the future of the NHS right across the country. by cheque – payable to Union Welfare 06451 and posted to Wigan Health UNISON office, WWL Trust, Wigan Infirmary, Wigan Lane, Wigan WN1 2NN.